Our fishing, ski, vhull runabout boat bimini tops are 46" tall, which is standard for these types of boats. To determine which one of our tops you would like to order, first figure out how long of a top you need. This would be roughly the length of the area of shade you want to provide. Our fishing, ski, vhull, runabout tops come in convenient lengths of 6' & 8' lengths. Then, determine the width of the top that you need. Measure from center to center across your estimated mounting points. Vortex bimini tops come with the hardware for a top and side mount application, depending on your needs or preference. We carry 3 main widths of tops. 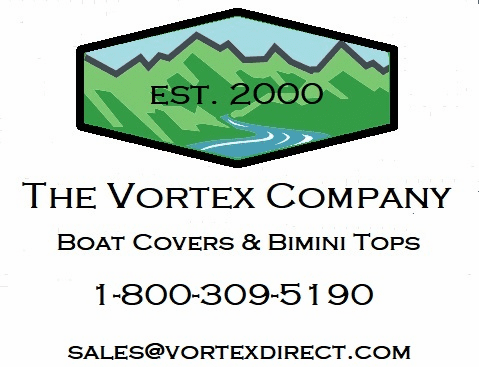 We generally recommend storing your Vortex Bimini Top in the fully folded/collapsed position when not in use. Vortex Bimini tops are extremely waterproof, so leaving them extended gives them the opportunity to collect water, and possible damage to the railing due to excess weight. This ensures no water collection, and greatly reduces the chances of damage. Damage resulting from excess water collection would not be covered under warranty. 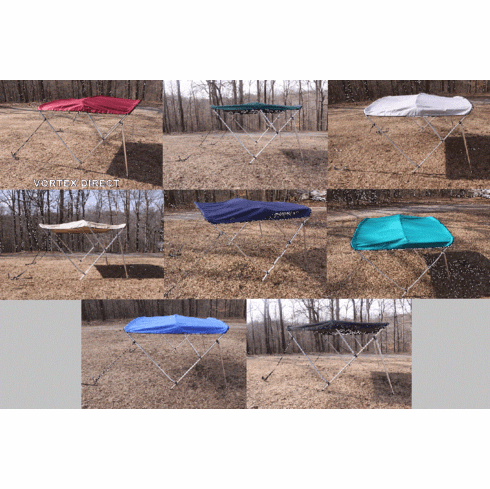 Instructions are included with the Vortex Bimini Top....1 page, front and back, with pictures. Installation is very easy for anyone with even moderate handyman type skills. It is a 2 person job, with basic hand tools. A cordless drill, tape measure, screwdriver, pencil, etc. Installation is generally a 1 to 2 hour job. 5 year warranty on defects in materials, both for frame and for fabric.